our graphic designer will create a unique design just for you! Our friendly attendants set up and break down the equipment, attend to the props table, and test the booth for the perfect picture! They also assist party-goers with using the booth, texting & emailing pictures, and distributing printed photos. Also, if you choose to have a photo guest book, we will assign an attendant just for that! funny glasses, hats, signs & more! we also make custom props as requested. contact us so we can start designing yours todaY! after your event, you will receive your online gallery, which will be complete with all the photos from your event. easily share your gallery with your guests so they can relive the photobooth fun too! guests may also download photos they forgot to text here. Galleries may be password protected by request. Dual screens allow guests to take pictures at the front of the booth while texting and printing on the back. Guests can easily browse through the back screen gallery to view, share & reprint their pictures. -Captures photos, boomerangs, gifs & more! -print size options: 4x6", 2x6" (two strip prints), 6x6" or 6x8"
Let your guests leave you a special note next to their photobooth photo! Read more about our memory books below. Ideas for Custom Props: “Mr. and Mrs. NEW LAST NAME”, your wedding or event hashtag, your wedding or event date - anything you like! Contact us today so we can start designing you something special. our photo guest book add-on is a favorite at weddings! 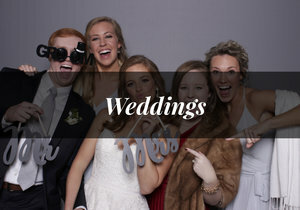 They are a perfect way for guests to leave you a special note as well as an awesome photobooth shot! With our guest book option, one photo is printed for the book addition to the photos we are printing for each guest. Our friendly photobooth attendants will assist you with the book and keep the area tidy. Each guest book is designed to match your event colors and custom template. 12x12" album, scrapbook paper, stickers, stamps, metallic pens & more! Beautiful sequins that change color with the swipe of a hand! Choose from: grey, white, hot pink, red, black, green, “disco”(colorful), greenery wall, aloha floral, gold/white geometric, pink marble or gray marble. Custom backdrops: Step & Repeat style with corporate logos, custom colors & fabrics, etc. Contact us for specific requests! 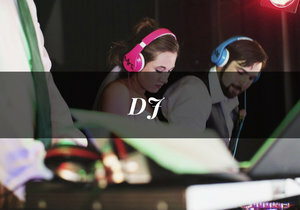 Get $50 off any Photobooth package when you book a DJ!